Four hours from Hanoi is the amazing UNESCO World Heritage site and geological phenomenon known as Ha Long Bay. According to Wikipedia, the bay features thousands of limestone karsts and isles in various sizes and shapes. We opted for a night on a small cruise ship to truly take in the amazingness of this natural wonder. In sticking with Justin's list theme I am going with one of my favorites- high/low. In keeping with my way of doing things I always start with my low only to end on a high note. The biggest low had to be the weather. Every other day on our trip was sunny and over 25 degrees Celsius. The 24 hours we were on the bay had to be 12-14 degrees, gray, and cloudy skies. We look so happy despite the weather. Justin didn't bring any pants so he was staying warm with a pair of shorts, a long sleeve shirt, and a rain jacket. 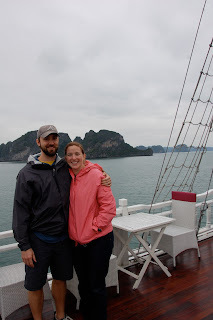 But even with the unfortunate weather it was hard not to be in awe of Ha Long Bay. The formations went on for as long as we could see. 1.) The unbelievable scenery. I have never seen anything like Ha Long Bay. One thing I enjoy about traveling is seeing the amazing things God has created and when you visit a place like this it is hard not to be in awe. 2.) During our cruise we also visited one of the four fishing villages that still exist on the bay. This was interesting because I don't think I have ever seen this size village on water. We were taken by a local on a boat tour around the village. In the small rowing boat the bay seemed enormous. 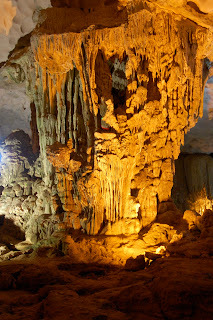 The formations were huge and all around you. I still can't believe that they live completely on water. Small homes hooked together form the village. Sticking with the Communist theme even the homes in the fishing village rocked the national flag. And when your arms get tired just use your legs. This kid might have been 8 years old and he was just cruising around using his feet. 3.) The amazing cave and no I am not making that up that is what it is called. You be the judge. My science teacher of a husband informed me this is an example of a stalactite and a stalagmite. He wasn't sure what it was called once they connected. Technically, Ha Long Bay is one of the seven New Wonders of Nature. One New Wonder of Nature down, six more to go. 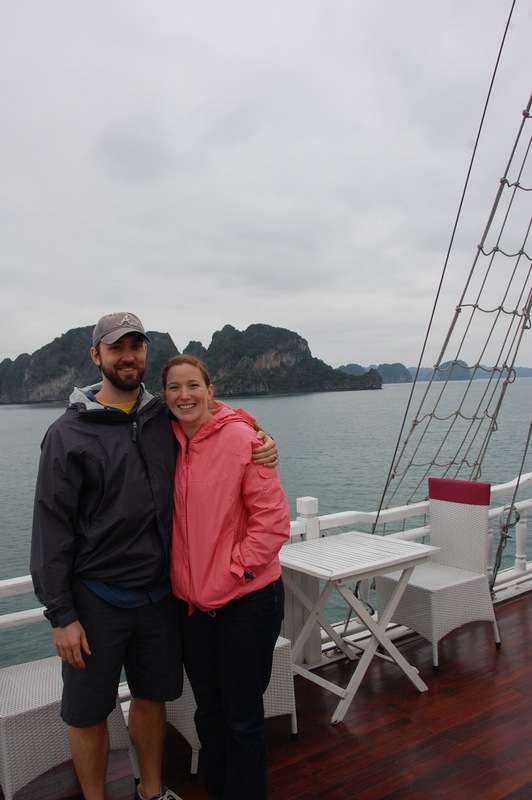 Minus the awful weather, which is just our luck, we still enjoyed Ha Long Bay. It is something you don't see very often and something truly to be appreciated. From here we head to the middle of Vietnam!